Q – Is there a way to check for duplicate customer purchase orders when entering new orders in Order Entry? A – Yes. Sage Accpac ERP v5.5 lets you specify whether Order Entry displays a warning, an error message, or no message when you process an order or a standalone shipment that uses the same purchase order number as an existing order or shipment for the customer. The setting can be found on the Invoicing tab of the A/R Customer maintenance window. Warning – If you select this option, Order Entry displays a warning message if the purchase order number is used on any existing orders or standalone shipments for the customer when you try to process an order or a shipment that uses the purchase order number. You can still process the duplicate order or shipment when you receive a warning. Error – If you select this option, Order Entry displays an error message when you enter a duplicate order or standalone shipment for the customer, and you cannot post the duplicate order or shipment. Q – Is there a setting the General Ledger module that would allow new recurring entries to be added to an existing open batch? A – Yes. 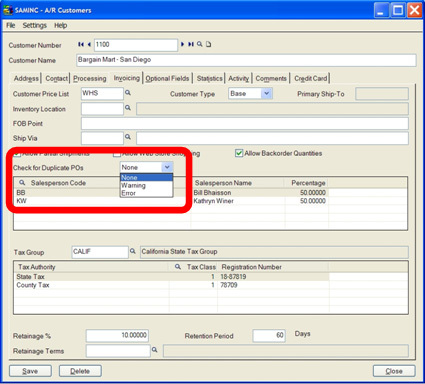 In Sage Accpac ERP v5.5, the users have the ability to choose method for creating the recurring entry batch. In the Create Recurring Entries Batch window, you can select the appropriate method. The options available are Default, Create a New Batch, or Add to an Existing Batch. Default – When you select this method, the batch will be appended to an open batch if the existing batch has the same run date as the new recurring batch, otherwise, a new batch is created. Create a New Batch – When you select this method, a new batch is created. Q – Can I perform a mass filing of Outlook e-mails in CRM? A – Yes. You can select a set of sent or received e-mails in Outlook and file them to CRM in a single action. When you perform this action, CRM will look only for a match with the first e-mail address in the batch you have selected. For example, if you select two e-mails in Outlook, the first one from William Dolan and the other from Karen Ward, CRM will look to match a person or company against William Dolan’s e-mail address only and will file both e-mails against this record in CRM. If CRM does not find a match for the first e-mail, the user must manually match the e-mail batch to a record in CRM. Select the CRM button in Outlook and log on to CRM. Click on the Sent Items button. Select the e-mails you wish to file in the Sent Items pane and click on the File E-mail button. The File E-mail screen is displayed. You can view details of the first e-mail and the CRM record against which the e-mail will be matched. All of the e-mails filed in this batch will be saved under this record in CRM. Click on the File E-mail button. Q – Can I add a shared document to an Outlook e-mail as an attachment? A – Yes. You can add documents from the My CRM | Shared Documents tab as attachments to an e-mail sent from Outlook. Select New | Mail Message. Click on the Attach Shared Doc button. A list of shared documents is displayed. Select the document you wish to attach to the e-mail and click on the Attach button. Note: If the Attach Shared Doc button does not appear automatically on the New E-mail window, select View | Toolbars | CRM to activate it. Q – How do I change Control Accounts when closing Unbilled PO Receipts? In Sage Pro 7.4, the control account will be populated with the item control account used when creating the PO by default, for all the lines in the Closed Unbilled PO Receipts screen grid. To change the control account, place the cursor on the column with the header X for the specified item record and press CTRL+E. This will display the Select Account screen where you can select another control account. Under the Transaction menu, click Close Unbilled PO Receipts. Select the unbilled PO receipt that needs to be closed for the vendor. Place the cursor on the column with the header X for the specified item record and press CTRL+E. This will bring up the Select Account screen where you can change the control account. For versions prior to 7.4, to change the control account, place the cursor on the column with the header X for the specified item record and press the spacebar. This will display the Select Account screen where you can select another control account. Place the cursor on the column with the header X for the specified item record and press the spacebar. Q – How are Prepayments identified on the AP Aging Report? A – Prepayment checks will result in a prepayment debit memo that must be applied to an invoice at a later time. The As of Aging report reflects prepayments as a negative amount based on the check date used. A prepayment check for $100 with the date 01/01/05 will appear on the As of Aging report as "-100" with the date of 01/01/05 (this date refers to the invoice date, post date, due date). This negative amount will remain on the reports until the Prepayment Debit Memo is applied to an invoice. The date used for applying the debit memo will determine the date it will no longer appear on the As of Aging reports. For example, if the prepayment debit memo above is fully applied to an invoice using the date 02/01/05, the negative amount will appear on As of Aging reports up until 01/31/05. It will not appear if using an as of date of 02/01/05 or later. Q – How can I setup a Change Log for a Table? Under the Maintain menu, point to Dictionary and click Tables. Select a table from the Table ID picklist. Select the Log Changes option from the General tab. Update from Data Dictionary for this table. In the System Manager documentation refer to "Using System Utilities" for more information on using this utility. The Log Changes option is only available to specific Sage Pro tables. There are Sage Pro tables that do not have the capability of tracking changes in a log. Please refer to the System Manager documentation under the Data Dictionary section to find which tables that cannot log changes. Only payroll files are automatically configured to track changes. Only payroll files are automatically configured to track key changes. Under the Print menu, point to System Logs and click Change Log. Enter the appropriate parameters into the options grid and generate the report. The Change Log report will display any changes made to key files. This entry was posted in June 2008, Newsletter and tagged ACCPAC, Axis Newsletter, CRM Features, CRM Software, Customer loyalty, Customer Relations Management (CRM), Customer retention, employee retention, Enhanced customer satisfaction and retention, Enterprise Resource Planning (ERP), ERP Solutions, Sage Accpac, Sage Accpac ERP, Sage CRM, SageCRM. Bookmark the permalink.